So guess what! My blog turned eleven years old this week! Whuuuut! I keep forgetting to do blog birthday posts - I've only done them for my fifth and sixth blog birthdays respectively - and I totally missed the big tenth birthday last year because we were travelling through Cambodia. Whoops. But better infrequent than never, so happy eleventh birthday to Sarah Cooks! That's eleven years, 1177 posts, and more chocolate than I care to admit! Thanks everyone for joining me on my food journey! The blogging world has changed a lot since I started, but my passion for food and my incessant need to record everything I do is still going strong. I update my blog quite regularly, about five to nine times a month, but don't forget to follow me on Facebook, Twitter, and Instagram for even more food-related goodness! (I recently signed up for Snapchat and Periscope, but literally have no idea how to use those - it just seemed that's what all the kids are doing these days, and I didn't want to miss out, heh). 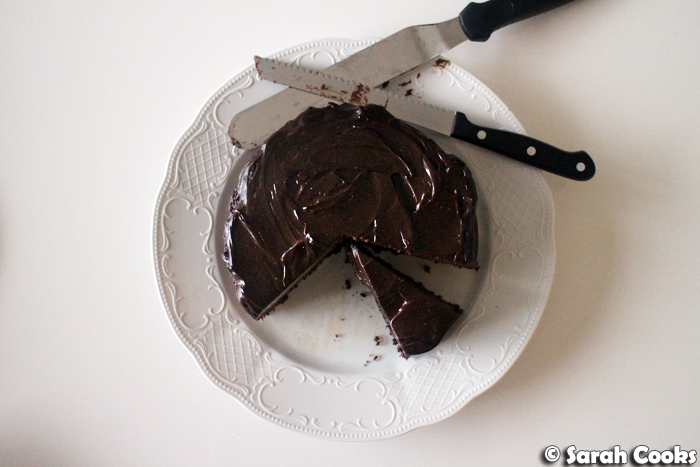 Today's post, of course, had to be a chocolate cake. 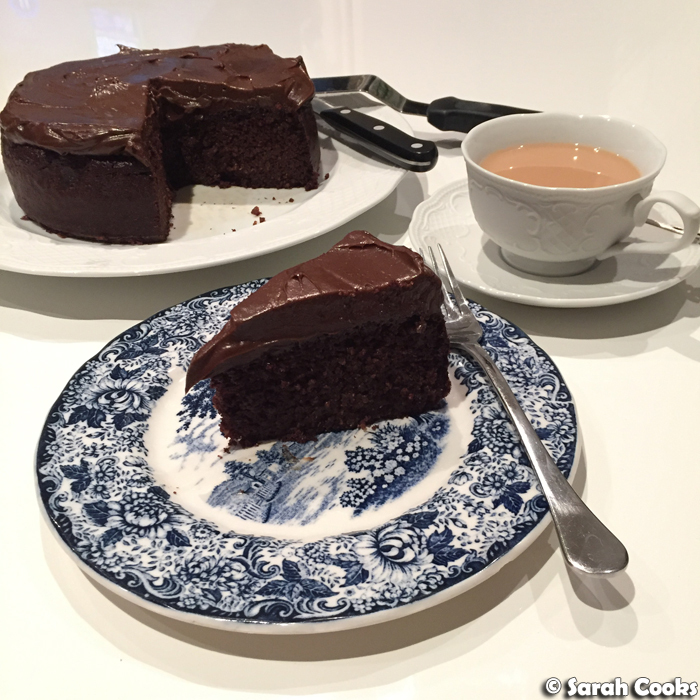 I don't bake chocolate cakes that often any more, but I saw this chocolate quinoa cake on Lorraine's blog a short while back, and was immediately intrigued. She first tried it while on a yoga retreat, and was given the recipe by the chef there. When she made it herself and posted up the recipe on her blog, it just looked so rich and chocolatey and fudgy and I just Had To Have It! It's gluten free and flourless, with the heft in the cake coming from cooked and cooled quinoa. (Just quietly, I am totally over quinoa in savoury dishes, and was glad to find a delicious use for the sad jar of quinoa I had left in my pantry!) The other ingredients are eggs, milk, lots of cocoa, coconut sugar, leavenings, vanilla extract, butter and coconut oil. This would easily be made dairy-free by subbing in almond or soy milk and using all coconut oil. It's quite easy to make - basically you just chuck everything in the processor and whizz! Despite my fascination with healthy cooking and baking, I've never gotten into coconut oil in a big way. I keep reading that it has lots of health benefits, but I can't get over my fear of saturated fat. And more importantly, I often find the strong taste of coconut oil overpowers other flavours. However, when this cake was baking, it smelled absolutely gorgeous! The chocolate-coconut combination was extremely inviting. I actually used a higher ratio of coconut oil-to-butter than Lorraine did; next time I'd go all coconut oil. 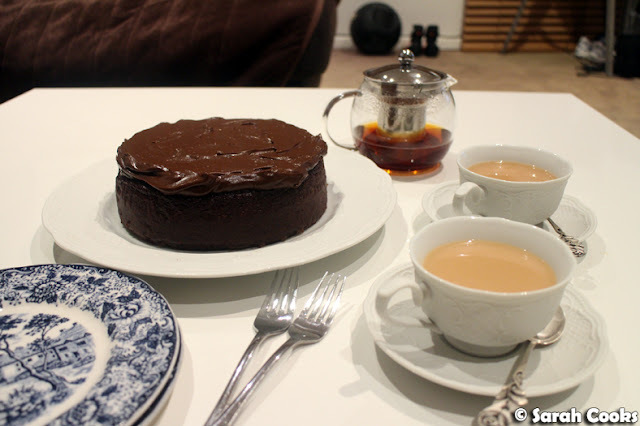 I also eschewed the coconut-cream based icing in the original recipe, and (of course), went for the avocado-based chocolate icing that I've previously made to top a vegan avocado chocolate cake. Well, I had a lot of avocados to use up! 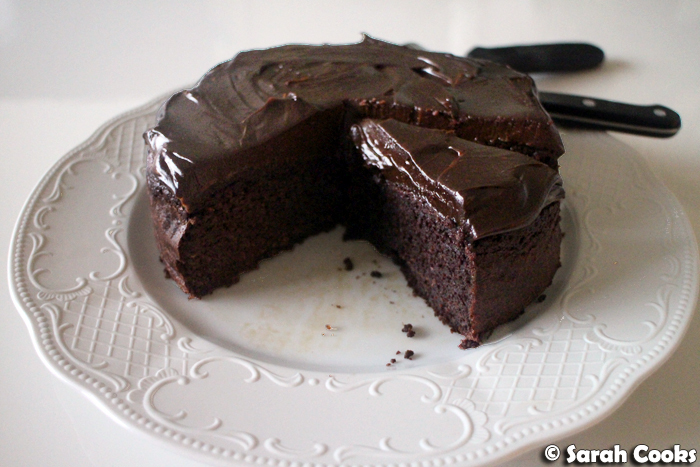 And I love how glossy and luscious it is - I knew it would compliment the rich fudgy chocolate cake perfectly. So - the taste! 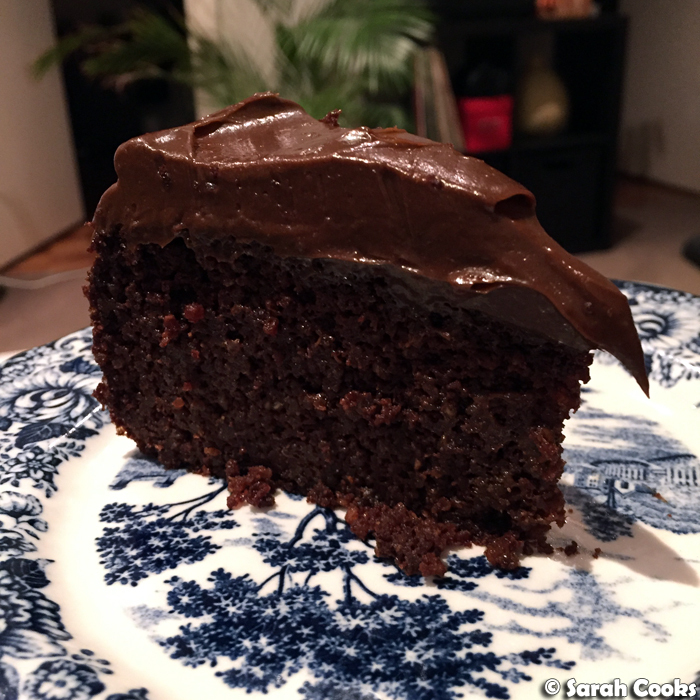 The cake is deeply chocolatey (all that dark dark cocoa! ), and incredibly moist, almost like a pudding. Interestingly, the quinoa didn't get completely ground up in the processor, so there were lots of little quinoa flecks throughout the cake, which gave an unusual, but not unwelcome, slightly crunchy texture. In addition to being delicious, this cake keeps well - leftover pieces lasted for a week and still tasted good. So moist and luscious. Enjoy! 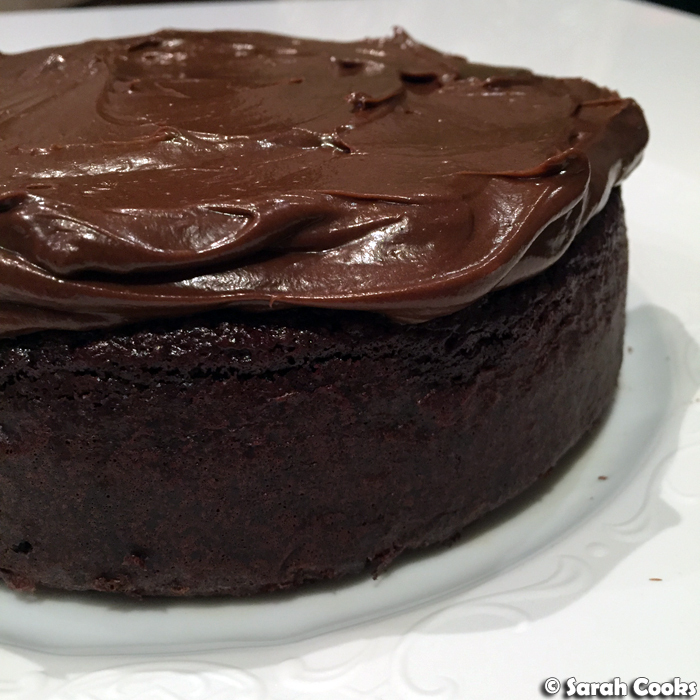 Thanks to Lorraine for sharing this recipe, and thank you all for following my blog! Here's to the next eleven years! Preheat the oven to 175C. Line a 20cm springform tin with baking paper. Place the eggs, milk and vanilla in the bowl of a food processor, and whizz to combine. Add the melted butter, coconut oil and quinoa, and whizz again. 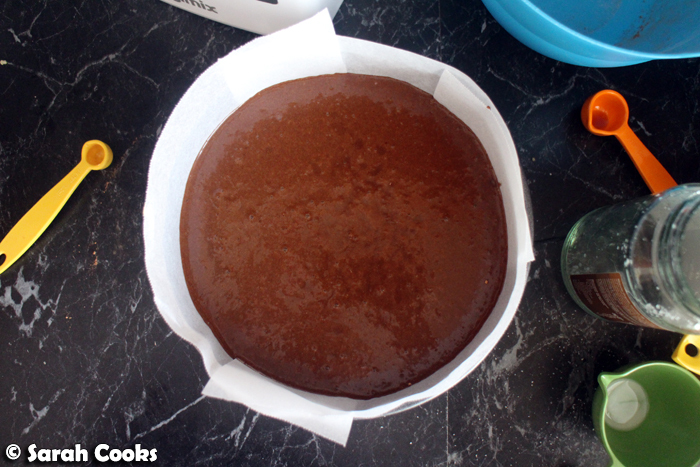 Add the coconut sugar, cocoa powder, baking powder, bicarb and salt, and whizz again until combined. Pour the mixture into the prepared tin. (N.B. it is a very liquid mixture). Bake for 30-40 minutes, or until cooked when tested with a skewer. Allow to cool completely in the tin before turning out onto a serving plate. Place the avocado flesh, cocoa powder and icing sugar in a food processor and whizz to combine. Add a tablespoon of water if necessary to achieve a spreadable consistency. Spread the icing over the top of the cold cake in a swirly fashion. A very Happy Anniversary!! Wow you have been going so long!! Well done and may there be many, many more. So glad that you liked this cake Sarah!! Woke up to this-what a lovely surprise! Happy anniversary! Long time reader, first time commenter. Made many of your recipes, and just truly enjoy your writing! Also enjoy living vicariously through you and all the travel tips! Now, this cake looks amazing! Very delectable! It's very inviting! Looks tasty and I'd like to make this! but... quinoa isn't mentioned in the Methods. What step should it be added? Made this as cupcakes a few days ago. (I make cupcakes often). They sank in the middle when out of the oven for a few minutes, but didn't mind as this gave me a nice well for a piped star :) Great recipe thank you!